We reviewed BoinxTV's full version last year and found that it was a powerful home studio setup. 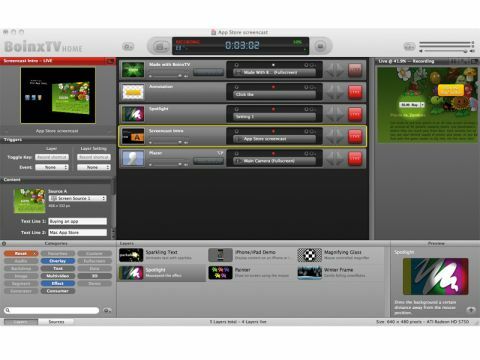 It uses a system of layers to control multiple camera feeds and enables you to insert pre-recorded footage and add graphic overlays to a live video broadcast. That version is £300 on the Mac App Store, while this cutback Home version is just £30. You might be expecting a lot of missing features for that kind of reduction, but actually most of the power is still present, including features such as chroma keying and screen capture. The limitations are that you can't have more than one live camera source, the maximum output resolution is 960x540 and you can only have 15 layers simultaneously. The layer limit won't bother most people, and we doubt the camera limit will either; nevertheless, the resolution's disappointing. The interface is BoinxTV Home's most impressive feature. It's powerful but clear, with your inputs and variables on the left, layers in the middle and live output on the right. There's no editing of recorded footage, so you may well need to use iMovie in conjunction with it. In fact, Apple's Themes can replicate some of what BoinxTV does, but not with live footage, and BoinxTV's features in this area far outstrip iMovie's once you get into it. Combine the two and you have a powerful studio package.